Electric ArtBlock was the first new construction Artist Live/Work Loft project built on the West Coast. 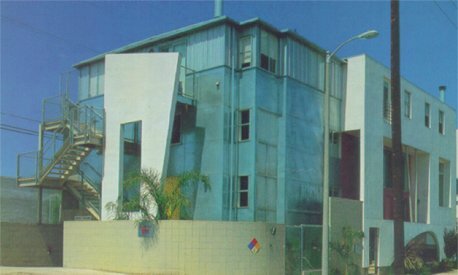 A 27,964 square foot, 20 unit artist loft live/work project in Venice, California, it was developed and built between 1988 and 1991 on a 17,500 square foot lot. Located on an abandoned and derilict former electric railroad track bed approximately 350′ long by 50′ wide, at Electric Avenue between Santa Clara and San Juan Avenues. The property is commercially zoned with a 30′ height limit and an R-3 residential density. It is constructed of wood studs, smooth troweled stucco and galvanized sheet metal over a 10″ thick concrete floor slab over the semi-subterranean parking garage supported by concrete columns with concrete block exterior perimeter walls. The project was designed in collaboration through a joint venture of Hank Koning of Koning Eizenberg Architecture and Glenn Erikson, Ph.D., AIA. of Erikson Leviton & Associates. The project was developed by Venice ArtBlock, LLC, with Glenn Erikson as Managing General Partner and Neal Leviton as General Partner. Concerned about LA’s continuing sprawl, increasing congestion, and deteriorating quality of life and environmental issues Erikson began looking for a development site appropriate for a live/work project, in order to demonstrate the benefits of living and working in close proximity. However, LA’s zoning and building codes specifically prohibited this type of mixed-use development. However, LA did allow for artist housing when converting industrial buildings, and the Venice Community Plan contained an Arts & Crafts Overlay District which referred to artist housing. Believing these code conflicts could be resolved for the purpose of creating a demonstration project, he purchased this commercially zoned site with an allowable R-3 residential density in Venice within the Venice/Abbot Kinney Arts and Crafts district overlay. Using LA’s Planning Permit process, he guided the review and approval process to appropriately resolve the conflicting language between the Venice Community Plan, the California Coastal Act plan, the City’s Zoning Code and the Artist-In Residence regulations within the LA Building Code. Opposition to the Planning Permit came from local developers who had been unable to design to the allowable density due to the 30′ height requirement, the high water table, and the tight site which presented difficult design constraints for both parking and building design. Dr. Erikson offered to give them funds for street trees on their adjacent properties on Electric Avenue in return for their dropping their protests. As there was no other neighborhood opposition, the Construction Documents were then completed. Construction financing was another issue, as appraisers and lenders were not familiar with such a concept. Erikson contracted with a retail appraiser, who combined commercial appraisal format with residential rents to achieve the necessary valuation, and identified a local commercial bank to finance the project based on this novel approach. Upon completion the property leased exclusively to artists at market rents. Many of these artists participated in the annual Venice Art Walk in the early years of the complex. The success of this project helped lead to passage of the Mixed-Use Housing ordinance in Los Angeles, and the creation of hundreds of artist live/work housing units across Los Angeles.